Nancy Abraham is Executive Vice President, Documentary Programming, for Home Box Office. She is responsible for the development and production of HBO Documentary Films which have garnered prestigious industry awards including Primetime Emmy® Awards, News and Documentary Emmy® Awards, George Foster Peabody Awards, Alfred I. DuPont Awards and Academy Awards®. She was named to this position in 2018. 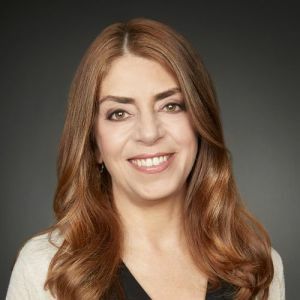 Prior to joining HBO’s documentary division in 1995, and promoted to vice president, HBO Documentary Programming, in 1998, Abraham was director, Film Acquisition, acquiring feature films and other programs for HBO’s international channels. She also spent three years in Budapest as director, Programming, for HBO Hungary. Abraham previously worked at Bravo Cable Network in both acquisition and production capacities. She has served as a moderator and participant in numerous industry panels/events including the Sundance Film Festival, the International Emmys®, the Real Screen Summit, AFI/Silverdocs, IFP Independent Film Week, the Full Frame Documentary Festival and others in the U.S. and abroad, and as a Forum delegate at the International Documentary Festival of Amsterdam (IDFA), the Hot Docs Producers Forum in Toronto and BritDoc. She has also served as a member of the Non-Fiction Peer Group Executive Committee of The Academy of Television Arts and Sciences (ATAS), the selection committee for the duPont Awards and the IFP’s Gotham Awards Committee, as well as a juror for the News and Documentary Emmys®, the Hampton’s International Film Festival, the Woodstock International Film Festival and MountainFilm Teluride. Abraham is a board member of SPW-USA, a youth-led international development organization, and was a founding board member of Doc Fest, a documentary film festival in New York City. She is a member of New York Women in Film & Television, NATAS, ATAS, and was featured in The Hollywood Reporter’s “35 Under 35 to Watch” article in 1998. She holds a Bachelor of Arts degree in History from Vassar College where she was elected to Phi Beta Kappa, and attended Columbia University's School of International and Public Affairs.